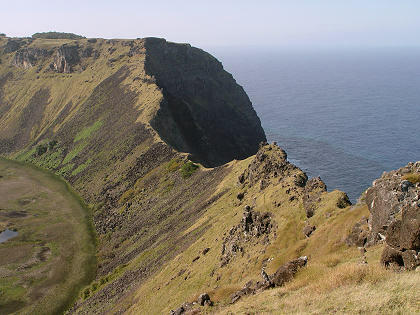 The crater of Rano Kau. You can click on this picture to enlarge it (284 kb); use your browser's "back" command to return here. 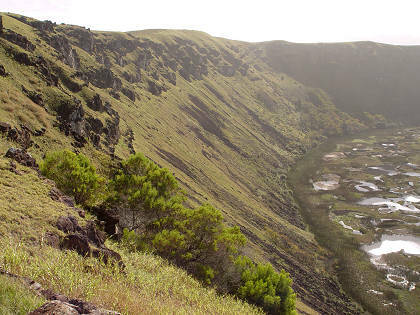 I followed a walking trail that lead to the narrowest part of the crater rim, and from there I enjoyed a spectacular panorama of the crater, the cliffs of the rim, and the ocean beyond. Looking into crater, the crater floor was dappled with blue ponds, but most of the surface was covered with a patchwork of living and dead reeds, green and brown in color, looking like numerous interconnected islets. The crater rim had a big eroded gap where the sea is relentlessly washing it away, bit by bit. Where the southwest portion of the rim ended in a rocky cliff, there were numerous petroglyphs chiseled into the rocks. To view the petroglyphs you had to climb on the sod roof of one of the stone houses, and there was a sign saying that no more than five people were allowed on the roof at a time. 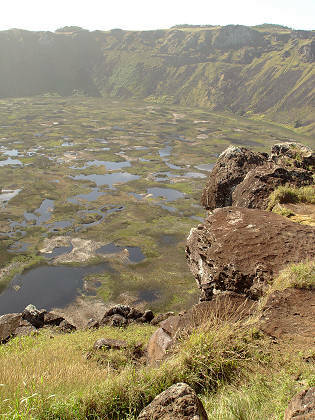 From this overlook I also had a good view of the motus (islets) just offshore from Rano Kau. These are the same islets that we passed several times as we motored from anchorage to anchorage. The tall pointy islet is Motu Kao Kao, and the flat islet is actually two islets: Motu Iti and Motu Nui. Walking around, one thing I noticed was the lack of interpretive information describing what you're looking at, either trailside signs or a guidebook. Many notable things were numbered as if keyed to a guidebook, but I didn't notice any booklets in the office. 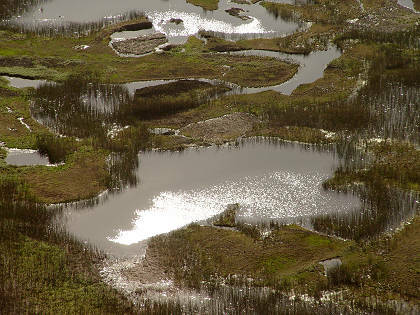 Reeds and small islets on the crater floor.